Available in a range of sizes and capacities, Avery Weigh-Tronix bench bases are designed for a range of environments and applications. Bench scale bases can be paired with a range of indicators, software and accessories for a complete weighing, checkweighing, counting or data management solution. 3600 Series High resolution digital QDT Bench Bases, die cast aluminum base construction with a stainless steel shroud supplied with 10' of cable for connecting to either a PC-820 counting scale or E1310 indicator. 9503-15729 ................... 3633T-50 ................ 50 lbs ........................ 12" x 14"
9503-15730 ................... 3633T-100 .............. 100 lbs ...................... 12" x 14"
Note: E1310 has 9-pin connector on base end and stripped and tinned leads on indicator end. Note: PC-820 cable has 9-pin connector on base end and a 9-pin connector on PC-820 scale. 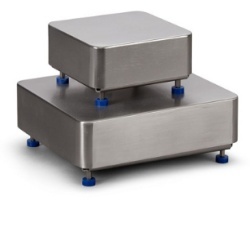 Tough carbon or stainless steel bench scales with a large range of sizes from 30 to 500 lb capacities. Built for a lifetime of hard work, they have one Weigh Bar and no moving parts for low maintenance. Options include a ball top shroud and portable cart. Large selection - Capacities range from 30 to 500 lb. Deck sizes consist of 14, 18, 20 and 24"
Rugged - Overload stops protect scale from excessive loads or dropped objects. Reliable - Single Weigh Bar design with no moving parts for low maintenance. Ball-top shroud - Reduces operator lifting and bending. Portable cart - Easily move the scale from site to site. Extended cable length - Beneficial for when the application calls for placing the indicator at a remote location. BSNO Series comes standard with 10' weight sensor cable. They have a high grade powder paint finish understructure and shroud. Food safe Bench Scale Cart provides an opportunity to add mobility to systems using a Diamond Series Bench Scale or ZQ375 Checkweigher. Constructed from food grade stainless steel with reduced bacterial traps. This single cart design has location points to secure 20"x 20" or 24" 24" Diamond base. Cart comes with a range of column stand assembly for the indicator (specify the indicator: ZM201, ZM300 series,GSE, E1070, WI127 or E1310). Torsion bases are checkweigher bases designed for washdown applications. They are all stainless steel and can take 500% overload. Each comes with a 10' weight sensor cable. AWT05-800045 ................... BSF-99-5 .................. 5 lb ................... 8.75" x 8.75"
AWT05-800037 ................... BSF-99-10 ............... 10 lb .................. 8.75" x 8.75"
AWT05-800039 ................... BSF-1214-25 ........... 25 lb .................. 12" x 14"
AWT05-800047 ................... BSF-1214-50 ........... 50 lb .................. 12" x 14"
AWT05-800048 ................... BSF-1214-100 ......... 100 lb ................ 12" x 14"
AWT05-800060 ................... BSG-99-12 ................ 12 lb ................. 8.75" x 8.75"
AWT05-800063 ................... BSG-1214-30 ............ 30 lb ................. 12" x 14"
AWT05-800061 ................... BSG-1214-100 .......... 100 lb ............... 12" x 14"